Modular synthesis has returned with a vengeance, and there are a variety of ways to explore whether it is for you without emptying your bank account. Among plug-in developers, Arturia (www.arturia.com) and U-he (www.u-he.com) stand out for their sophisticated modular systems. Arturia’s ARP 2600 V and (Moog) Modular V cover the beginnings of modular synthesis by emulating two of the best-known systems of the mid-20th century. U-he synths Zebra, ACE and Bazille update classic modular concepts with 21st-century software technology. Propellerhead Reason, with its ever-growing collection of add-on Rack Extensions is another approach to modular that you can easily integrate with Live (see the March 2012 and November 2014 Live columns for details). In this month’s column, though, we’re going to look at the new OSCiLLOT modular system from Max For Cats (www.maxforcats.com). 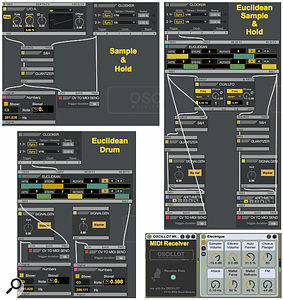 OSCiLLOT was developed in Max and is delivered as a Max For Live device. But don’t worry, you don’t need to be a Max programmer to use OSCiLLOT; Max for Cats have done all the legwork of creating the modules and the rack. To build your modular synth, just choose the modules, patch them together and play. Two features characterise a modular synth, and being made up of modules is not one of them; all synths are made up of modules. The first characteristic is that you can connect the modules however you like (patchability) and the second is that you can choose the modules you want (configurability). All modular synths are patchable (albeit not always with patch cords), only some are configurable. In hardware, for example, the Eurorack is configurable, whereas the classic Moog modular systems (recently re-released) are preconfigured. OSCiLLOT is patchable and configurable. It comes with over 100 modules for generating and processing audio, control voltages (CVs) and notes. Max For Cats plan more modules and also provide a software developers kit (SDK) for those who want to design modules in Max, so third-party modules are undoubtedly in the offing. Screen 1: These fairly simple OSCiLLOT patches illustrate a sample & hold note generator, a Euclidean drum sequencer and a combination of the two that uses the Euclidean rhythm to drive dual sample & hold patches. 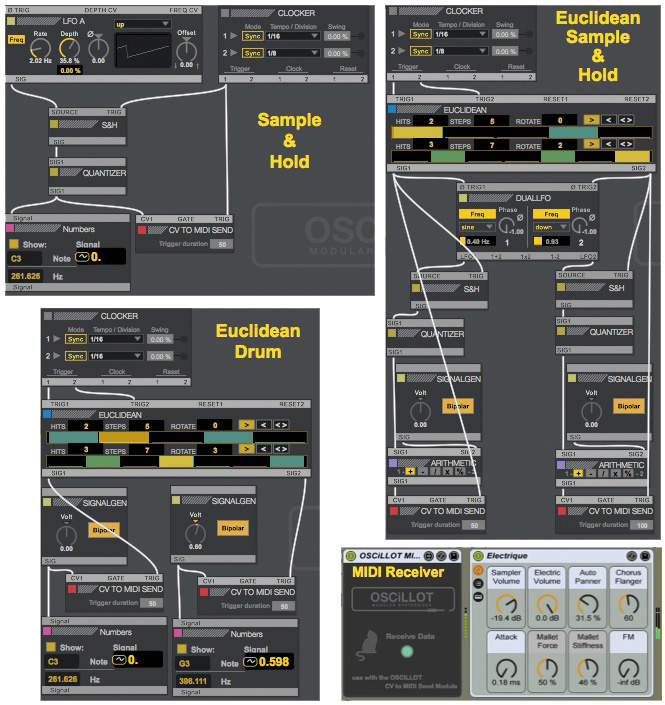 The MIDI Receiver routes the patches to Live tracks.The OSCiLLOT Live Pack comprises three Max for Live devices (.AMXD files): OSCiLLOT, OSCiLLOT AFX and OSCiLLOT MIDI Receive. The first two are for building synths and audio effects. MIDI Receive lets you send MIDI data from OSCiLLOT patches to Live tracks. For example, that’s how you would play other Live devices from a sequencer you created in OSCiLLOT. Building modular instruments and effects starting from an empty OSCiLLOT panel can be quite repetitive because many devices use a similar arrangement of modules, and many of the patch cables are the same as well. For example, a typical MIDI instrument has a MIDI note input, an audio output and a voltage-controlled amplifier (VCA) whose level is controlled by an ADSR envelope. You’ll save yourself a lot of time by creating a ‘shell’ instrument containing those modules patched together in the usual way. While you’re at it, you might include a mixer and additional modulators for some extra flexibility. That may not seem like a particularly exciting starting point, but from the complement of sound sources in OSCiLLOT’s Oscillator and Sampler menus, along with sound processors on the Filters and Effects menus, you can fashion some very unusual instruments, which you can configure with a minimal amount of additional work selecting and patching new modules. A big temptation with configurable modular synths like OSCiLLOT is to build big, but you’ll save a lot of time and keep the load on your CPU down by creating the smallest patch that gets the job done. Add enhancements only as they’re needed. In that spirit, Screens 1 and 2 show five examples of ‘less-is-more’ patches. The Sample & Hold patch samples an LFO instead of the more typical noise source. With that you can generate repeating patterns by matching the LFO rate to the clock rate or, using different rates, get patterns that still have some predictability due to the waveform shape. For random output, use the ‘Random’ waveform. Notice that the clock triggers both the S&H and CV TO MIDI SEND modules and that the S&H module’s CV output is quantised to standard pitch CV values as shown in the Numbers monitor. Use Live’s Scale MIDI effect after MIDI Receive when you want to restrict the notes to a particular scale. 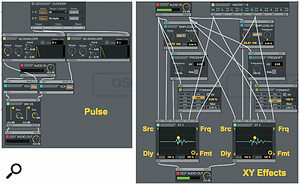 Screen 2: The Pulse audio effect (left) creates pulses from incoming audio. The XY Effects audio effect controls the mix of the source and three effects: delay, frequency shifter and formant filter.The Euclidean Drum patch generates two drum patterns: one from each row of the Euclidean module. That module has separate clock inputs, so you can drive the patterns at different rates. The two Signalgen modules set the pitches for the outgoing drum notes, and again, Numbers modules show the corresponding note names. The Euclidean Sample & Hold patch uses the Euclidean module to clock two sample & hold patches driven by a DualLFO module. The Signalgen and Arithmetic modules let you separate the pitches of the two sample & hold outputs in order to target different Live instruments. The Pulse audio effect shown on the left of Screen 2 uses AR envelopes clocked independently to control the levels of the right and left stereo channels of incoming audio. Try it for creating rhythms from noise (think passing trains) or any ambient sound. The XY Effects patch on the right is not as busy as it looks. The right and left sides are repetitions of the same patch, which feeds its channel of incoming audio to three effects and then uses an X-Y controller module to mix the source with the three effects’ outputs. It’s especially useful with drum and percussion loops. Try different left- and right-channel effects settings as well as a different complement of effects, including AU or VST effects plug-ins. In this patch, the OSCiLLOT AFX device’s Macro 1 and Macro 5 knobs are mapped to control respectively the X and Y positions of both X-Y controller modules. If you have a joystick controller, map it to those knobs. As an alternative, you could manipulate the two X-Y modules with separate pairs of Macro knobs and two joysticks. Create new folders named OSCiLLOT in your User Library’s Presets folder in the categories for Max Audio Effects, Max Instruments and Max MIDI Effects. When you want to save one of your patches, rename the OSCiLLOT device as desired and drag it to the appropriate OSCiLLOT folder. OSCiLLOT can be a CPU hog. When you’re running out of juice, the first things to check are that Live’s Audio buffer size (Audio Preferences) is 256 samples or greater and that each instance of the OSCiLLOT instrument device that is not in Mono mode has Eco(nomy) mode enabled. After patching, hide the cables for easier access to the controls. The ‘+’ and ‘’ buttons at the right end of the menu bar offer four magnification levels. Smallest is easiest for cabling, whereas largest makes the controls easier to see and manipulate. When creating an audio or MIDI effect for use with a specific AU/VST plug-in, keep in mind that OSCiLLOT can host that plug-in, which saves tracks and avoids audio and MIDI routing issues.